Michael Macdonald sees Europe (and particularly England, France, and Germany) as the primary foundation of our western way of life, producing many of our greatest thinkers, artists, writers, politicians, and saints. 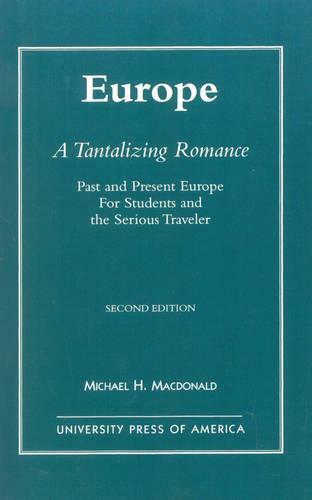 While Europe, A Tantalizing Romance affirms the value of all European cultures, Macdonald chooses to focus mostly on the literary, artistic, philosophical, and theological contributions of England, France, Germany, Russia, central Europe, and Scandinavia, as well as a number of Europe's most visited cities-London, Paris, Berlin, Munich, Vienna, Prague, Moscow, St. Petersburg, Copenhagen, Rome, Florence, Venice, Madrid, and Athens. This book provides readers with a brief, scholarly, practical synthesis of what Europe stands for and has to offer its visitors. Revised numerous times based upon the author's experiences as Director of the European Quarter at Seattle Pacific University, this is an invaluable guide for travelers and non-travelers alike.